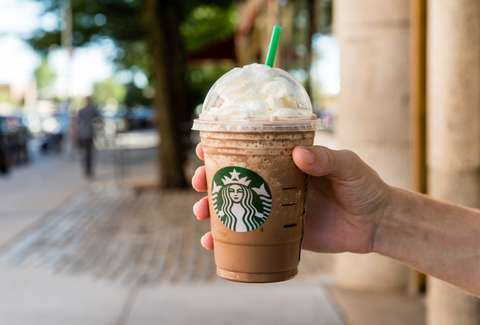 If you're in the camp of people who can't believe this is short because it's only Thursday and feels like a 463-day week, it looks like Starbucks may be able to help you at least get through the afternoon with a treat: half-price Frappuccinos. On Thursday, September 6, Starbucks locations across the United States will take 50% off any Frappuccino blended drink in a size grande or larger (tall Frappuccinos and bottled varieties are not included). That's a good deal if you've yet to treat yourself to your go-to sugary dessert in a cup this summer. If you're grabbing a pair of Frappuccinos for you and a friend, it's basically a buy-one-get-one (BOGO) deal. They can buy 'em next time. The half-price Frappuccinos couldn't have come at a better time, considering the heat this week. And since it's way too warm outside to even think about sipping a Pumpkin Spice Latte, this could be your chance to at least dip your toe into fall flavors by getting the Frappuccino version, or that of Starbucks' decidedly less-basic alternative fall drink this year, the Salted Caramel Mocha. Or you can stick with classics like caramel and mocha. The Frappuccino deal is this week's installment of Starbucks' string of "Happy Hour" promotions, which are seemingly meant to help you get an afternoon caffeine boost for cheap. To take advantage of these deals, you have to sign up for Starbucks Rewards or already be a member and you'll receive barcodes for the discounts via email. That's it. Now, you can get your fancy blended drink for more or less the cost of a drip coffee, which may or may not make the extra calories and sugar worth it. Additionally, like the chain's previous happy hour promotions, it's only valid after 3pm local time. So, you aren't getting half off on that morning cup. It's also only available at participating locations, so if you're dead set on getting a discounted drink, it's probably worth giving your local shop a call before you show up. If they aren't participating, try the Starbucks across the street.